The University’s CSTARS facility provides researchers, educators, and government officials satellite imagery of the Arctic region. Dome-covered antennas on the University of Miami’s Richmond campus rise toward the sky ready to receive information from earth-orbiting satellites passing above. The satellite imagery streaming into the UM Center for Southeastern Tropical Remote Sensing (CSTARS) processing facility provides valuable pieces of information to study the effects of climate change and melting sea ice on the Arctic—one of the most sensitive regions on Earth to global warming. Since 2003, CSTARS Director Hans Graber, also a professor of ocean sciences at the Rosenstiel School of Marine and Atmospheric Science, has been at the helm building relationships with government agencies and satellite operators to collect large swaths of remote sensing data from satellite images that stream directly into the facility. The images are available to researchers, graduate students, and government officials around the world to help better monitor these global hotspots for climate change, and other environmental hazards. UM Rosenstiel graduate student Macarena Ortiz is working with CSTARS’ high-resolution images taken from a camera affixed to an orbiting satellite to help improve the current projections of seasonal sea ice melt in the Arctic. Ortiz has developed a new technique to quickly analyze the imagery to estimate the size of sea ice melt ponds in the Arctic Ocean. 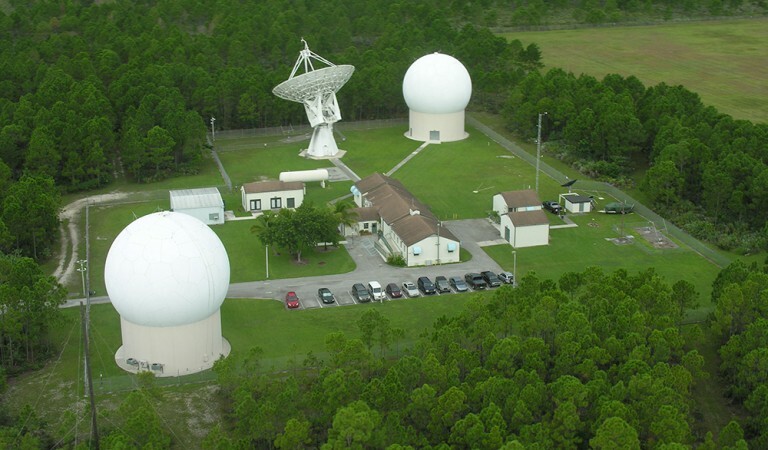 The UM Center for Southeastern Tropical Remote Sensing (CSTARS) is located on the University’s Richmond Facility campus in south Miami-Dade County. The UM Center for Southeastern Tropical Remote Sensing (CSTARS). Melt ponds are brilliant blue pools of water that form on top of Arctic sea ice during winter. By measuring the ponds in the springtime, researchers can predict the extent of the summer melt season. Estimating the seasonal sea-ice melt is of interest environmentally and economically as climate change accelerates the opening of new shipping routes, including the famed Northwest Passage, in the region. A 30-year decline in summer sea ice and a longer melting season is beginning to change how cold the polar region is, which directly affects global circulation of the atmosphere and has the potential to accelerate global warming. This new seasonal melting cycle is causing more intense warming of the atmosphere in the Arctic, thus affecting global circulation and a faster melt of land ice which directly contributes to sea-level rise. The mathematical method developed by Ortiz uses an algorithm that offers the best method available to estimate three important components of the Arctic ice—the amount of ice, the amount of open water, and how many melting ponds are visible. “Once you have a section analyzed, you can very quickly and accurately calculate the overall melting season across the Arctic using this new technique,” said Graber. The Arctic, an ocean of frozen sea ice that grows and melts on a seasonal basis, is one of the most sensitive regions on Earth to climate change. The snowy-white sea ice reflects back into space nearly all of the sunlight that hits its surface. As temperatures rise, the sea ice melt absorbs more sunlight, causing further heating and melting of the ice and snow. Sea ice in the Arctic has been losing ground over the last 30 years. Although melting sea ice doesn’t directly contribute to sea-level rise (think of a melting ice cube in a glass of water), it does, however, have a direct influence on the global circulation in the atmosphere and on the rate of global climate change.